A leaflet distributed in France about the Algerian struggles of 2001. Originating in the Kabylie region, east of Algiers - home to some 5 million Berbers - the revolt spread across the country. 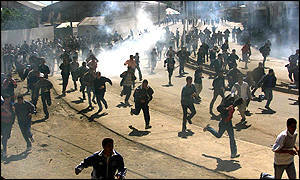 Over 120 people are reported to have died in clashes which continued for much of 2001. At this very moment Algeria is experiencing almost an insurrection which is progressively spreading throughout the whole country. Its heart is in Kabylie, 100 kilometres east of Algiers, the capital. It took off following the cold-blooded killing, on 18th April 2001, of young Massinissa by police in the local cop shops. It’s spreading now to the East of the country and is beginning to touch the West. This uprising goes further than the uprisings of 1980 and 1988. The government had managed to isolate the Kabylie in 1980. The intervention of the army and propaganda about a so-called claim to secession by the population of the Kabylie got the better of this “Berber spring”. In October 1988, the uprising of youth had been drowned in the blood of over 500 corpses. After the massacre, the regime encouraged the emergence of the FIS (the Islamic Fundamentalists). Afterwards it had been forced to concede democratic rights. But in the middle of the votes of 1992, it drew back from this democratic digression by means of a coup d’etat with its hardly disguised military structure. Today, the regime is facing a groundswell from the roots. The demonstration of the 14th of June in Algiers was the most massive demonstration ever organised since Algerian independence in 1962. People speak of almost a million demonstrators. It was drowned in blood. Today the regime is trying to play its strategy of tension and terror. According to an official report of June 12th there had allegedly already been 56 people shot dead, including 1 gendarme, and 305 civilians wounded by bullet shots. More than 1500 men from various sections of State security (cops, army etc.) had allegedly been wounded – which gives you an idea of the incredible level of the confrontations. This list doesn’t include those hurt or killed during the course of the march on the 14th of June and the dozens of daily confrontations since then: dozens killed and more than a thousand wounded. The uprisings have spread to all urban and industrial areas of the East and even a bit to the South-East of Algeria. In the West, the first demonstrations are appearing now, in Oran and in Relizane. The uprisings involve youth above all. They are the majority of the population (some 70% are under 30 years old) and everyday suffer the experience of misery: officially the unemployment level is 28% and hits youth especially hard. It’s mainly them who, with unprecedented courage, confront the gendarmes and the riot cops in dozens of towns and countryside areas. Officially, more than 54 cop shops have been set fire to. That speaks volumes for the fury of Algerian youth. The small farmers and inhabitants of the country areas also play an important part in this general uprising: it was the traditional village councils – the aarchs - of Kabylie (linked to the co-ordinations which are flourishing in the neighbourhoods and counties) who took the initiative to call the national demonstration of 14th June. We know of some villages being pushed back by the guns of the gendarmes as they pursued the demonstrators back to where they came from. In the end it’s the people of the cities, amongst them the workers, who have a determinant role. Co-ordinations have sprung up in the districts, the village communes and the counties and are connected through an inter-county structure, at first in Kabylie, but also in the East and now in the West, in Oran and Relizane. One can find lots of junior and secondary school teachers and trade unionists there. Today they make up the framework of a movement of resistance putting forward demands at a national level. They have elaborated a platform of 15 demands mainly dealing with democratic rights, but also cultural rights. It’s difficult to imagine the enormity of the split between the population and the government. The inter-county co-ordination had their platform delivered to the Presidency by 2 children, because it had vowed not to lead any negotiations with the representatives of the State. The street fights mustn’t eclipse the fights for liberty and democratic rights which are breaking out everywhere. Structures independent of official organisations are appearing: students, women, committees for democratic freedoms, especially of the press (which those in power are trying to gag with a new law they voted for in mid-June). Given the enormity of the housing crisis, thousands of flats have been occupied by the homeless and by those who are in poor housing, with the active help of the population. There have even been demonstrations to force the authorities to open the beaches of Moretti and the Club des Pins, normally reserved for State dignitaries, for the whole of the population! The social base of the regime is crumbling at great speed. In Oran, the capital of the West, the national organisation of “youth” – the vassal of President Boutelflika - the UNJA (National Union of Algerian Youth), couldn’t hold a demonstration as it had planned, despite all the official means put at its disposal. At the last moment it had to resort to a pathetic poorly attended sit-down. The UGTA (the Algerian General Workers Union), the official union which is integrated into the regime, is forced to take up part of the demands of the population (for example, the freedoms demanded, the recognition of Berber as a national language, etc.) and to denounce plans for privatisation, redundancies, and the seriously depressing cuts in the social welfare budget. Even in parliament, an official institution, if such exist,there’s open protest. The violence of the debates there echo the violence in the streets. The Big Unknown is the attitude of the workers. There are certainly strikes in the Health Sector (in Oran), some demonstrations of State sector workers and of teachers. But mass strikes which could finally finish off the government haven’t appeared yet. Yet there are indications that the regime has fixed its eye on this danger: in Tiaret, where the anger is rumbling and the uprising is threatening, the council decided, on June 20th, to agree to paying public sector workers three months’ wages in advance. This is unprecedented in a country where, on the contrary, people normally have to put up with having to wait several months to be paid. The Algerian uprising needs our solidarity. A lot of people in France think that the violence in Algeria is a part of the Algerian “national character”. This is untrue. The savagery there is that of the government and the rich, isolated in the face of the mass of a people who struggle, struggle for freedom. The Algerian community in France is a couple of million strong. Hundreds of thousands work in the industries and services or are amongst our workmates in MacDonalds, where we all submit to the same fate. The struggle for freedom for the vast majority of Algerian people must be translated into our mass solidarity in France.